Sent on a quest to rescue a princess, four clueless players must guide their players through dangerous forests, ancient ruins, and past the girl next door. 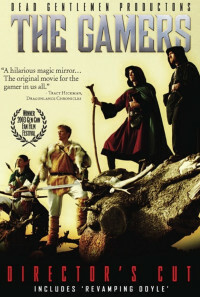 This is the story about a group of gamers as they play a role-playing game. At the same time, it follows their characters through the fantasy world they inhabit, as they attempt to reach the lair of "The Shadow" and defeat him. The scenes flip between the gamers in their dorm and their characters in the fantasy world (played by the same actors who play their gamer counterparts). The movie makes fun of both gamer stereotypes and the absurdity of many RPG rules and traditions. The game is frequently interrupted by a girl who lives down the hallway, telling them to be quiet. Regions are unavailable for this movie. Click the "Watch on Netflix" button to find out if The Gamers is playing in your country.